Can You Put a DAB Radio in Any Car? Many new cars now come with a DAB radio factory-fitted. For owners of older cars, however, the lack of a digital radio may eventually become a problem with the government committed to switching completely to digital once certain criteria are met, possibly as early as 2020. Even before then, you may wish to change to digital radio to receive extra digital-only channels such as Kisstory, BBC 1Xtra, Planet Rock and so on. What Aerial Do I Need? Rather than replace the existing radio, it might be easier to fit a DAB adaptor instead. These units have a separate aerial and work by either transmitting digital radio through a spare FM frequency or by plugging in to the aux-in socket, which generally gives a better sound quality. If you really want a replacement DAB radio, however, it is a more complex process and may not be possible. Most car radios fit into a standard DIN slot that measures 2⅛ inches (5 centimetres) by 7⅛ inches (18 centimetres). If the radio has the standard DIN rectangular shape and size, and there’s a continuous gap between it and the dashboard, it probably can be removed and replaced. Other car radios with a bigger screen and more features occupy a double DIN slot that’s twice the size. Fitting a new DAB radio is possible in these situations although you may need an adaptor kit that incorporates a fascia with a tray space. Factory-fitted radios in some cars have a more sculpted shape while others are integrated into the dashboard and can’t be removed. In these cases, an adaptor may be the only solution. 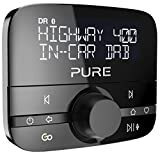 Any DAB radio you fit will probably have separate connections for digital and analogue aerials. Most come with an aerial that sticks to the interior of the windscreen and so is easy to fit with no drilling of holes. However, reception might be poor unless there is a strong signal. Better quality sound will be achieved by an aerial fitted to the roof, typically with a magnetic mount that will hold it in place at high speeds. The cable is routed through a door or the boot opening, but this can lead to water leaks if not fitted carefully. An alternative option is to replace the existing aerial, although this can be a complex process with the need to hide the cabling under the interior roof lining. In some cars, the aerial may be integrated with another feature or may be used for GPS purposes. In these cases, you won’t be able to replace the aerial but will have to use a separate aerial for the DAB radio. Once you’ve determined the radio can be replaced and the options to do it, you need to decide on the radio you want. 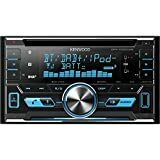 This may depend on the space you have available since a single DIN size will have a limited display screen while a double DIN model can provide a touch screen with more information and controls. 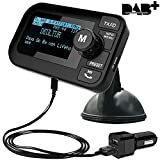 The amount of functionality and connectivity can also influence your choice, some radios providing FM and very occasionally AM reception as well as DAB. You may also get an aux-in socket, USB connection, a CD player, support for iPods and iPhones, and built-in Bluetooth. This will determine what you can play through your radio as well as enabling hands-free ‘phone calls. Although a new radio and components will come with fitting instructions, it’s not a simple process to fit a DAB radio, an aerial and connect everything together so it works properly. If you’re not sure what you’re doing, you risk damaging your car and ending up with a radio that doesn’t work. If you’re not totally confident about fitting the radio, it’s a job that’s best left to experts. There are plenty of audio installers around who are more than capable of doing the job. And, if you consult them early enough in the process, they will be able to advise you what you can do and the best way to do it, possibly saving you money and some heart-ache in the long-term. Halfords offer a car audio fitting service, though a local garage might do it for less. Can DAB Radios Receive AM Stations?